Linux is a great operating system. But there are more flavors of Linux than colors in a box of crayons. So how can you really learn Linux if your primary machine is a Windows box? 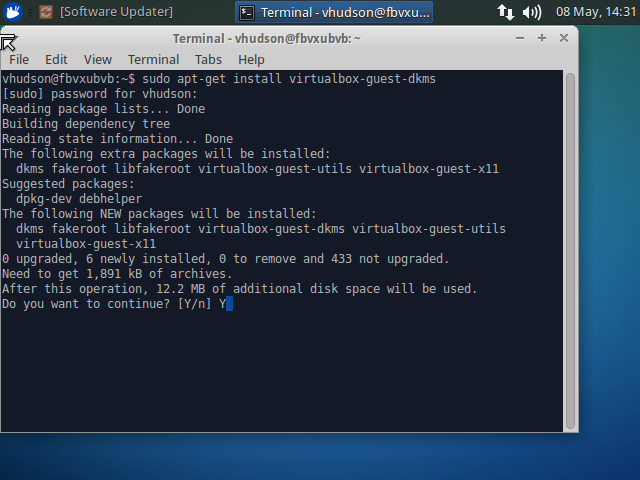 Today I’m going to show you, step-by-step, how to setup Linux in virtualbox. 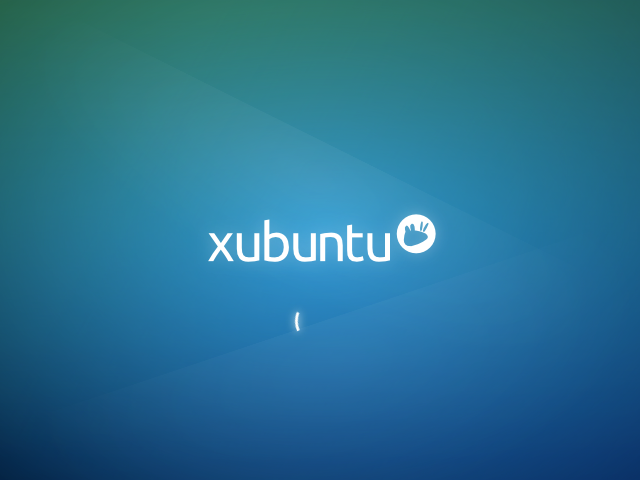 There are dozens of variations but we’re going to setup Xubuntu because it’s the easiest version to learn for Window’s users and it has everything all the other versions have. I’m going to walk you through everything from scratch! It’s time to make love to Linux haha. Whoa… where did that come from? 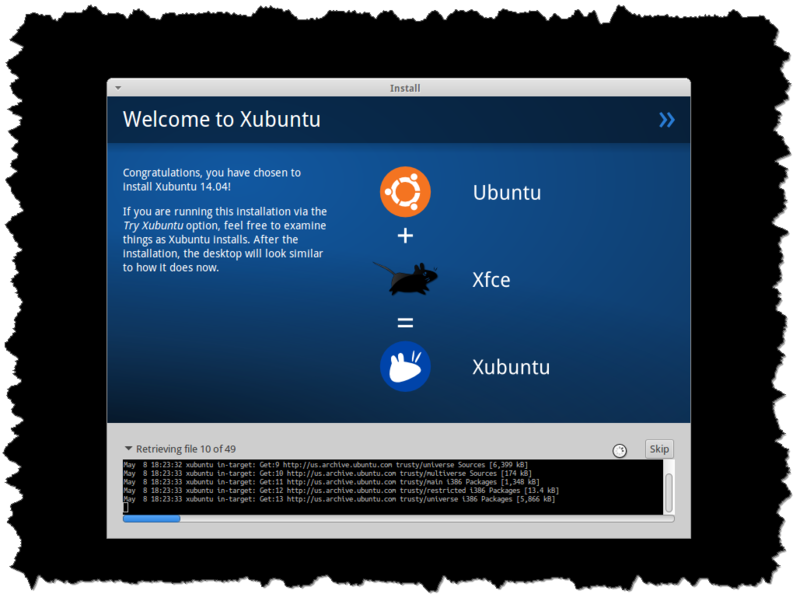 I’m going to show you how to setup a Xubuntu guest OS on a Windows 8.1 Update 1 host OS. Windows 8.1 will host the Linux virtual machine. I suggest having at least 25 GBs of free space. Having an SSD would also make things faster for you. Besides that, block out 2 or three hours because the Xubuntu ISO is fairly large and could take a while to download. 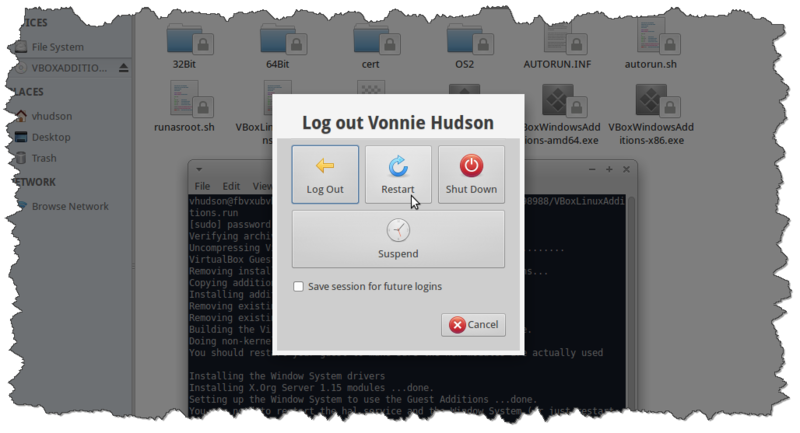 First, read my guide on setting up Virtualbox on Windows. 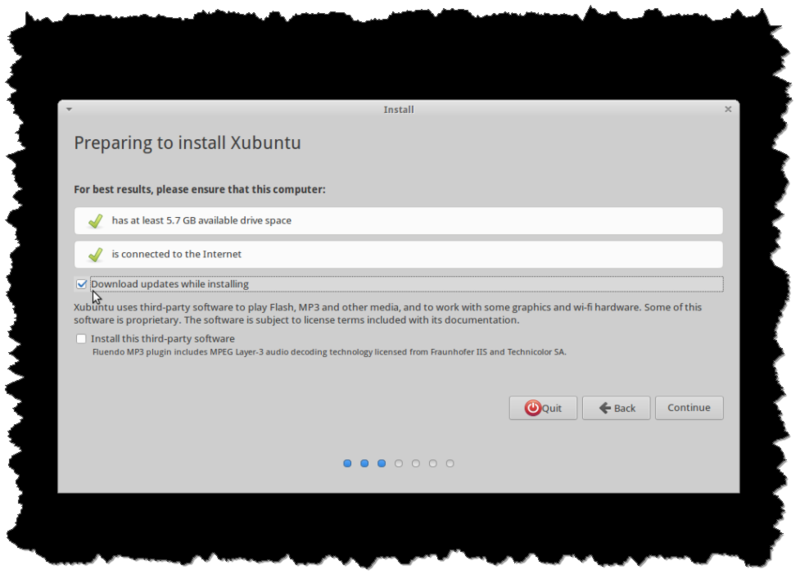 We’ll snag Xubuntu after you do that. 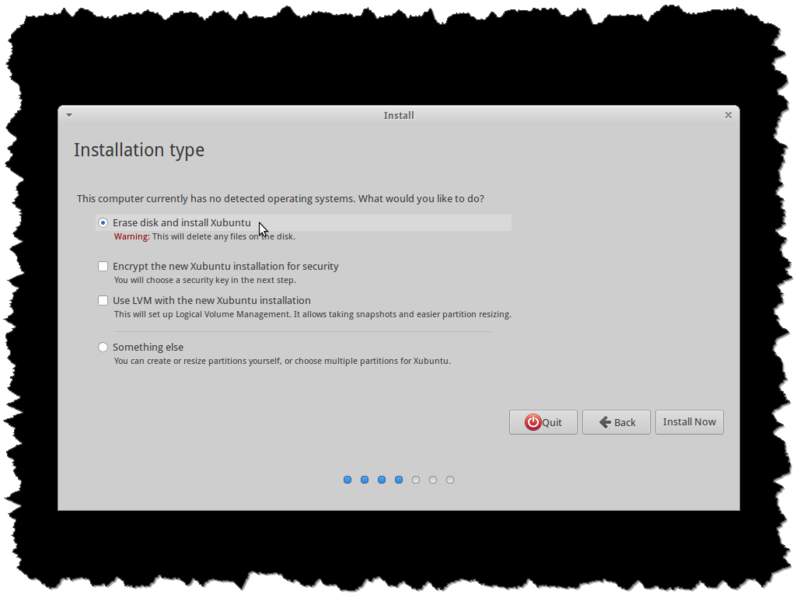 If Ubuntu and Debian Linux got together and did the nasty, their kid would be Xubuntu. Debian begat Ubuntu who begat Xubuntu. THe reason I like Xubuntu over Umbuntu is because the desktop manager is the closest approximates to Windows. 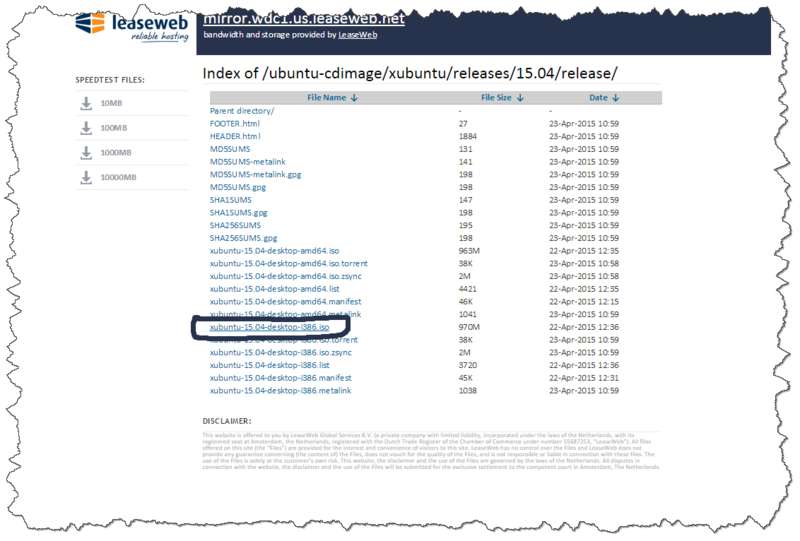 Ubuntu uses Unity but Xubuntu uses the XFCE manager which I find friendlier! So here’s the deal. 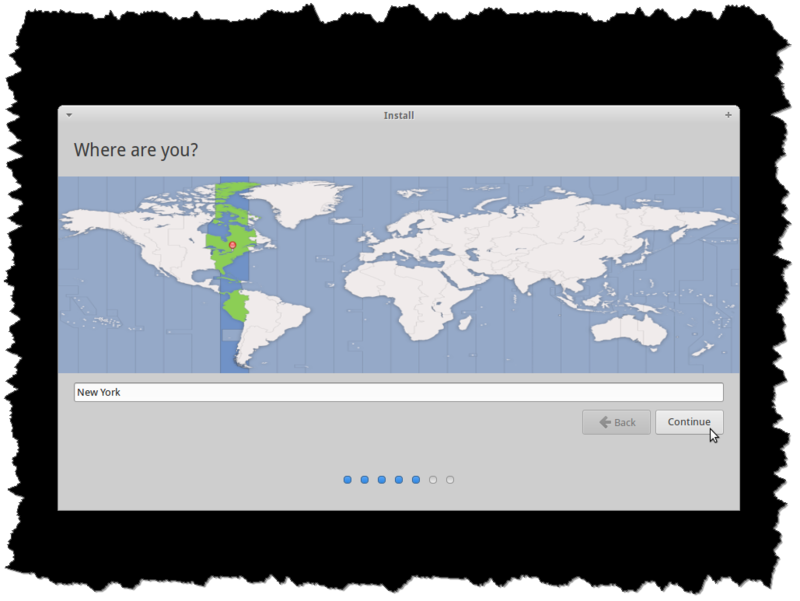 Download the Xubuntu ISO from nearby mirror and get going! 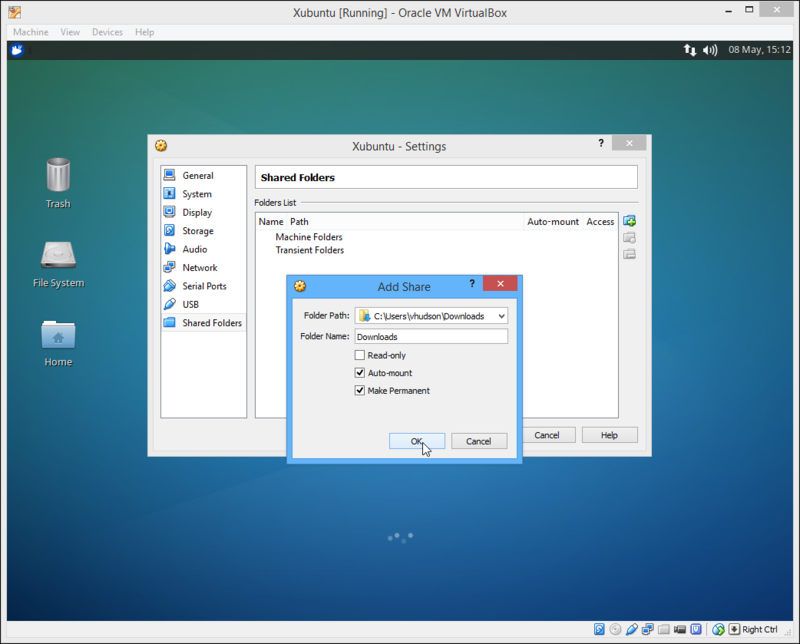 Now kick open Virtualbox. 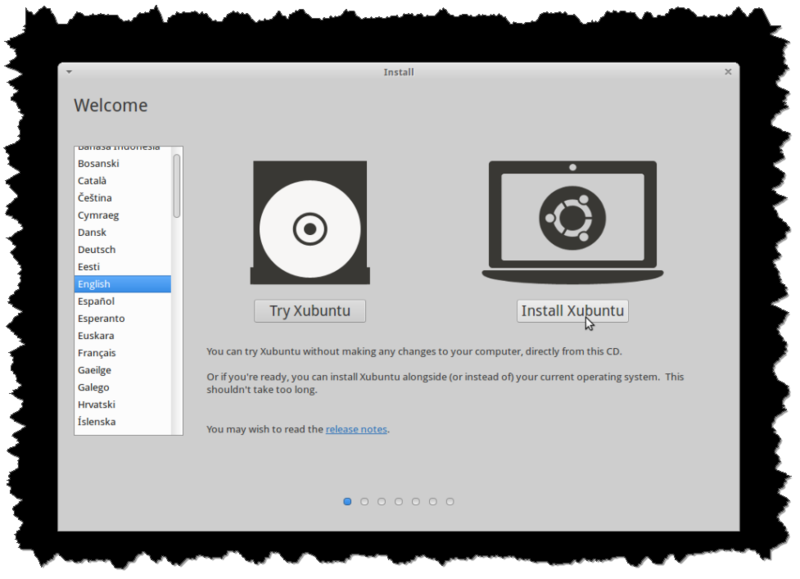 Select the Xubuntu image you created from my Virtualbox tutorial and then press Ctrl + s to view your Settings. Go down to Storage in the left pane then in the middle pane, click the Empty CD under Controller: IDE. Hit the mini CD on the right side of the window to browse to your ISO. Fire up your VM and boot to your shiny new ISO. Let’s click Install Xubuntu to kick this thing off. Put a checkmark in Download updates while installing and click Continue. 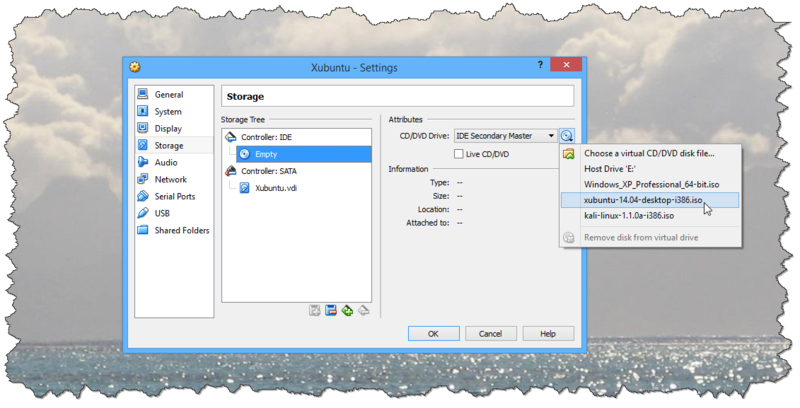 Keep the defaults to format your virtual hard drive for Xubuntu. Remember, this may be obvious, but I just wanted to clarify that this is the virtual guest hard drive not your real host hard drive. So it’s 100% safe. Pick your time zone and keep going! I’m in New York city so I’ll keep going. Make sure you’ve got the correct language set. This is also a good time to check the keyboard by typing in the test box. I intentionally chose a weak password because I plan on hacking this box with Kali Linux a little later. But I strong suggest you create a strong password. Xubuntu starts installing. 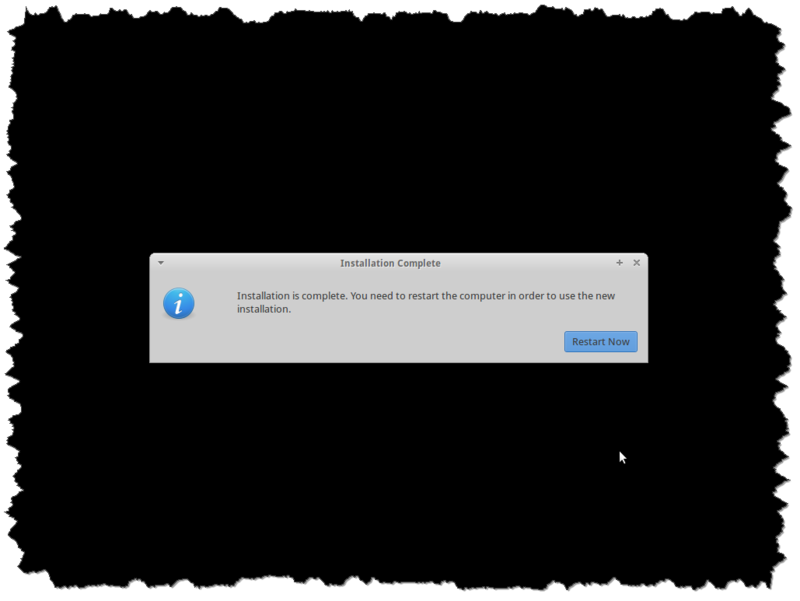 Click the little down arrow in the bottom left corner of the installation window to see what’s going on in the background. I wish the Windows installer had something like this! Oh what a pretty splash screen! Now one thing that you’ll immediately notice is that the screen resolution is all out of wack. It’s way too small but we’ll fix that. 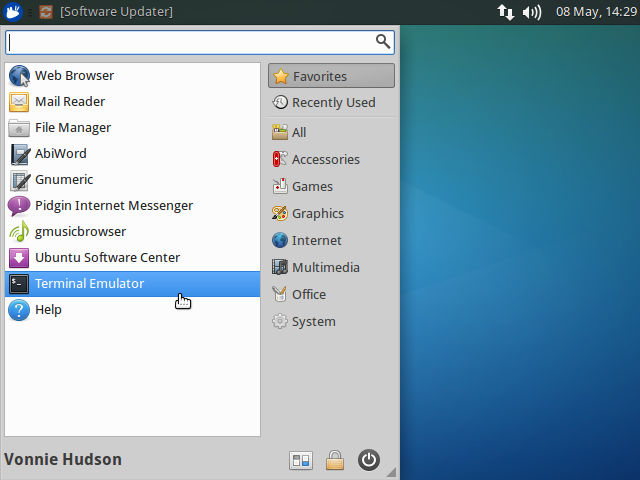 Click the little Xubuntu icon in the upper left corner of the screen and choose Terminal Emulator from the menu. 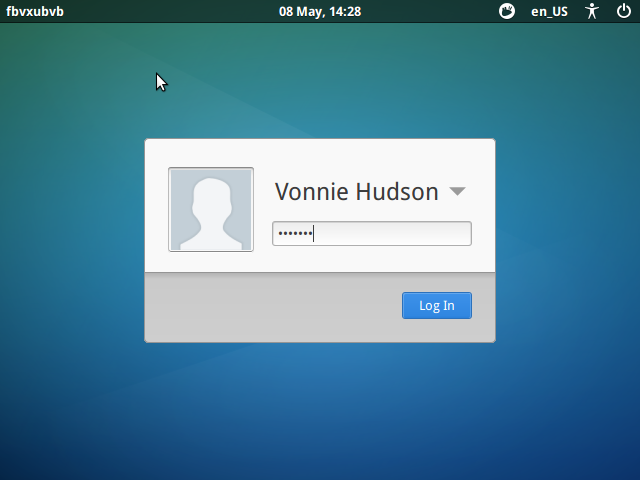 Allow Xubuntu to access a USB drive plugged into our Host machine. Allow us to copy and paste test between the guest and host OS’s. Very convenient. Allow us to drag and drop files between the guest and host OS’s. 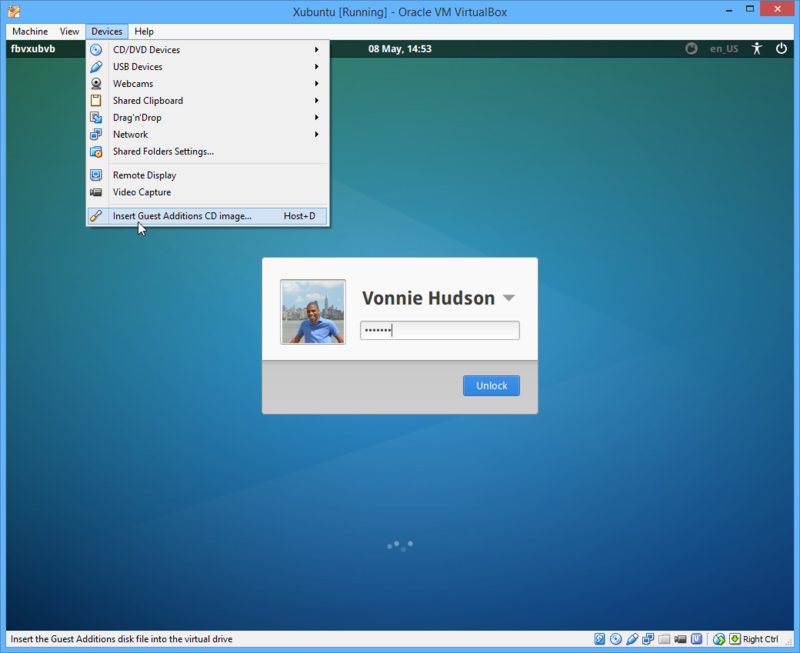 Click the Devices menu in VirtualBox and choose Insert Guest Additions CD image. When you login you should see the CD image in the background. 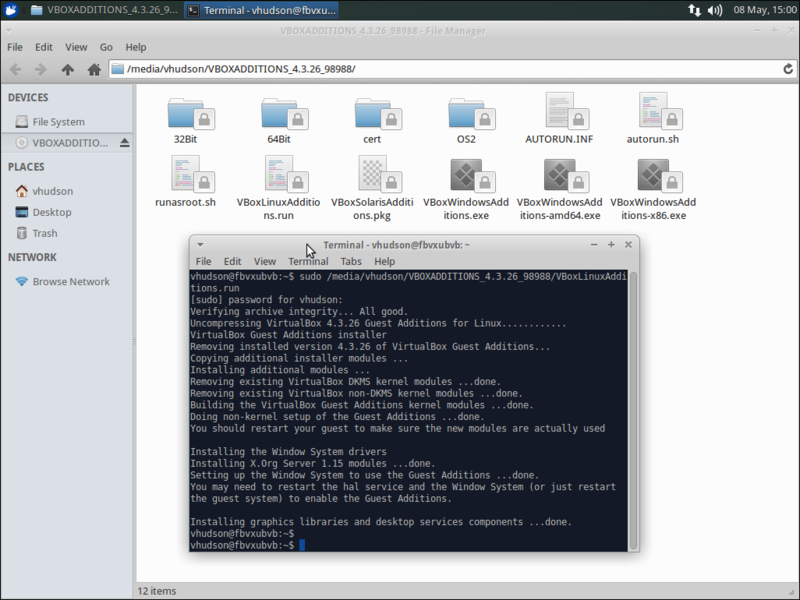 Open the Terminal Emulator again and run the VBoxLinuxAdditions.run file. Your path will look different but you can find it by looking int he location bar of the File Manager. Click the Xubuntu icon in the top left corner of the screen and type File Manager to open it up. Xubuntu should come back up like a champ. Now click the Insert Guest additions CD image option from the Devices menu and execute VBoxLinuxAdditions.run. I still can’t get Guest Additions to work! Once you have guest additions it’s time to have fun with it. 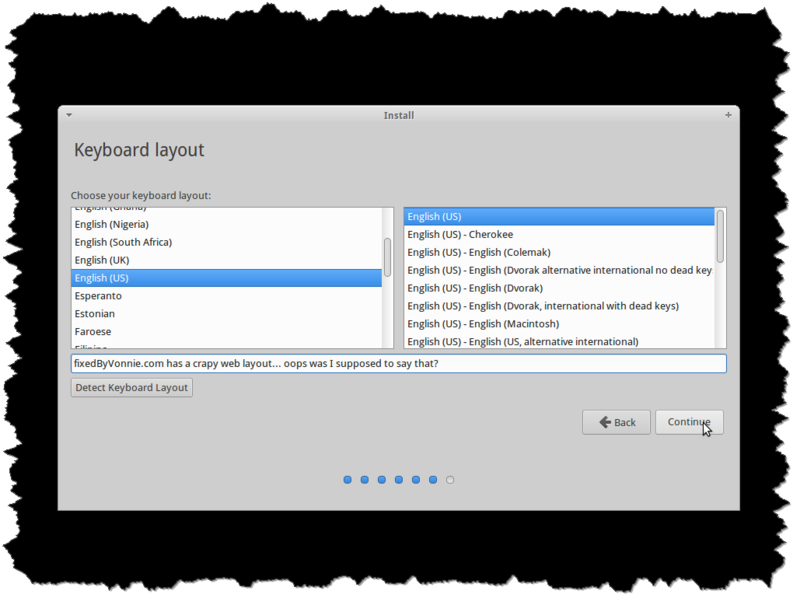 Click Devices in Virtualbox and make sure Shared Clipboard is set to Bidirectional. Now go back to Devices and make sure you’ve got your Shared Folders setup. I like to share the Downloads folder on my Host machine so I can quickly get files into Xubuntu. Oh one last thing! Change the background image to something more exciting. Defaults are boring. Just right click the desktop and pick Desktop Settings... from the popup. Rejoice my friend! Be elated! Sing to the sky! 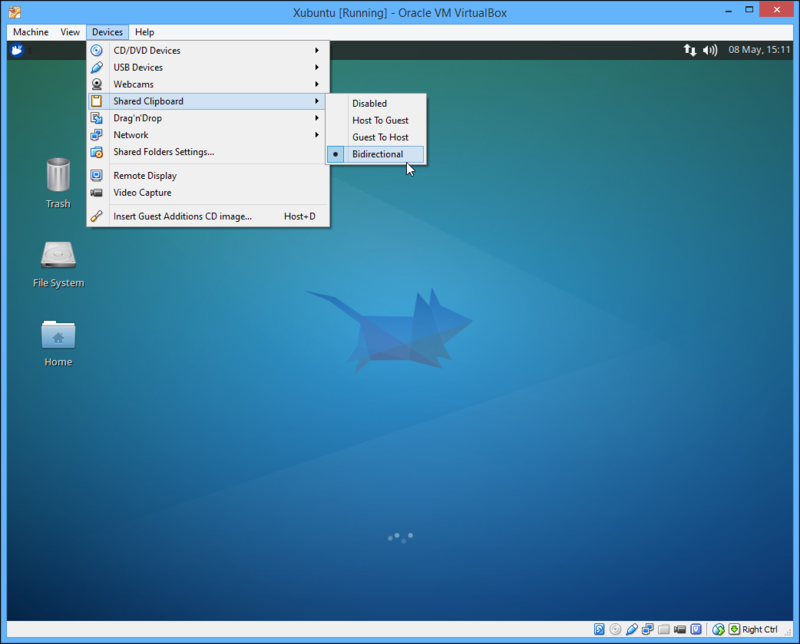 You now have Xubuntu Linux running on a completely virtual environment. You’re now in a perfect position to follow my tutorials on learning Linux. I promise you, if you follow me, I’ll dissipate your fear of Linux. Just give me a chance. I believe in you! You can do this. Onward. It’s time to conquer the world. Thank you very much. 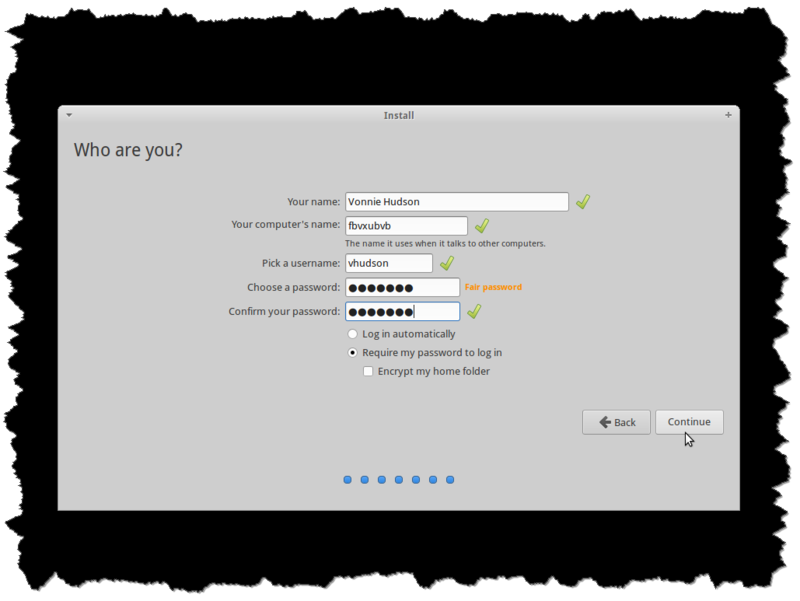 This was useful… I am new to linux. Just installed it for the first time.. I am looking to practice linux on my own and then try for a job in Security ( WAF or IPS).. May you please let me know from where should I start. Hey there. Everything worked great however I am getting this error when trying to open my shared folder in xubuntu: “Error opening directory ‘/media/sf_xshare’: Permission denied.” Do I have to do any permissions configuration on my Windows 7 machine? i got same error, did you found a solution ?